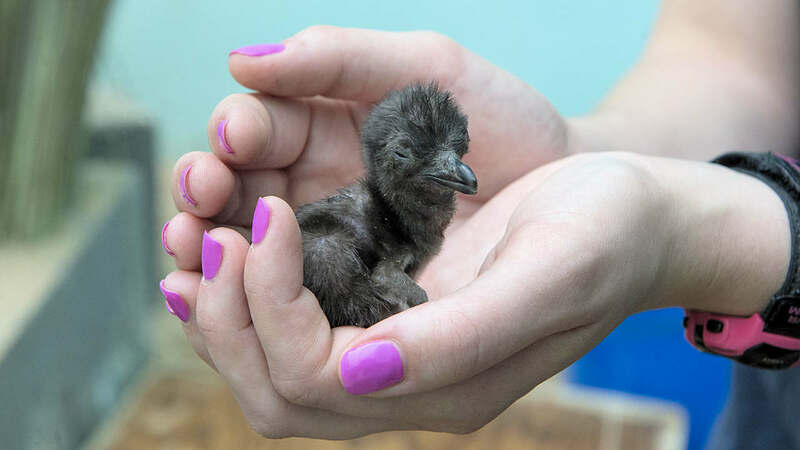 BRONX (WABC) -- The colony of little penguins that debuted in 2015 as a new species at Wildlife Conservation Society's Bronx Zoo has successfully produced a chick that is now on exhibit with the rest of the colony. The chick hatched May 10, 2016, marking the first time this species has bred at the Bronx Zoo in its 120-plus year history. Named for their small size and characteristic bluish hue, little penguins are also known as blue penguins, little blue penguins and fairy penguins. Adults are only about 13 inches tall and weigh 2 to 3 pounds. They are the smallest of the 18 penguin species and native to coastal southern Australia and New Zealand. Little penguins lay their eggs in burrows dug in sand, natural cavities, or under thick vegetation. They may even nest under man-made structures. Both parents care for and incubates the egg, and chicks weigh just 25 grams as hatchlings. They lose their downy plumage at about 50 days of age, when it is replaced with waterproof feathers. With the exception of the new chick, all of the birds in the Bronx Zoo colony were hatched at the Taronga Zoo in Sydney, Australia, and brought to the Bronx Zoo as part of a breeding program. Approximately 15 penguins a year hatch at Taronga, making it the most successful little penguin breeding program in the world. The Bronx Zoo penguins will help ensure continued genetic diversity in the little penguin populations in the U.S. The species occurs in temperate marine waters and feed on fish, cephalopods and crustaceans. They nest colonially in burrows on sand dunes or rocky beach areas. Like other penguin species, they use a wide range of vocalizations to communicate with each other. In the wild, their populations are threatened by climate change and human activities. The Bronx Zoo is supporting Taronga Zoo's little penguin conservation programs in Sydney Harbor. The work includes monitoring, awareness campaigns, rescue and rehabilitation, breeding programs, and more. Man-made nest boxes can provide safety from introduced predators and guard dogs have been used in some places to discourage predation. WCS has field conservation programs in more than 60 countries and all of the world's oceans. These programs use science-based solutions to save wildlife, including several penguin species and their habitats.